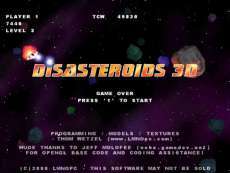 If you've ever played the original Asteroids or a clone thereof, then you know what this is about. No surprises here...same mindlessly entertaining gameplay with very nice Open-GL 3D graphix and lighting/particle effects. Very cool looking explosions, a battlefield that warps around at the edges, UFOs, shield, hyperspace, it's all here. Features stereo sound and support for force-feedback joysticks. Settings menu is accessed with the ESC key.